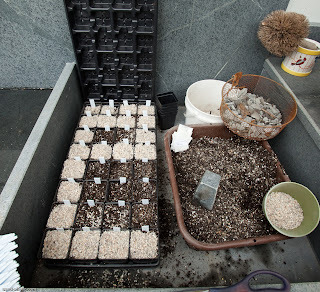 Though a very nice selection of seeds from extremely desirable plants arrived at the end of last year, they sat tucked into a cubby all through the holidays. Then came the of snows. January and February provided records of it. The snows took full attention, be it space or lack of, light or lack of, movement or hibernation. Greenhouse plants sulked almost as much as I did. 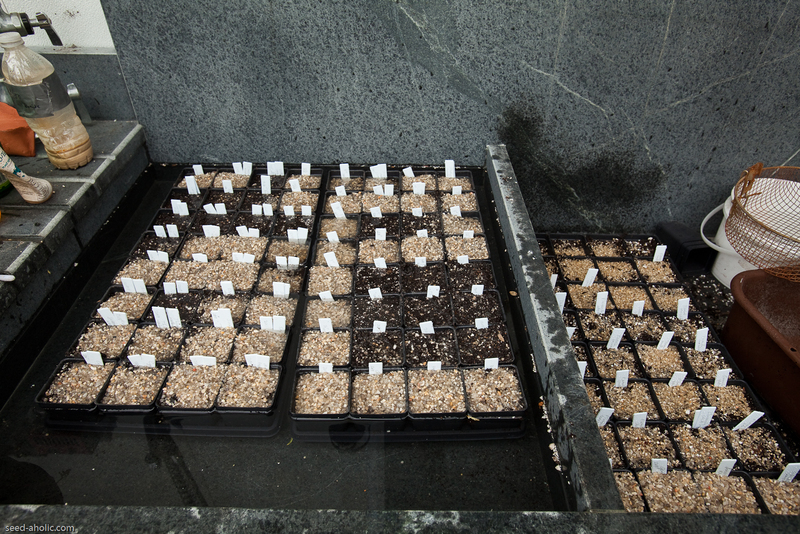 Several times I glanced at the packets, even went so far as to sit down and make out labels for them, but lost motivation to sow them. 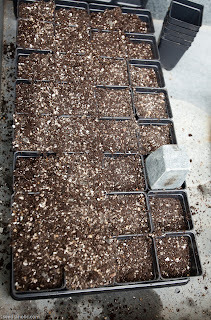 The mounting snow encouraged recriminations- why didn't I put everything needed to pot seeds in the greenhouse last fall? Finally, a trip to the garden shed to find the potting supplies was made possible by the snowplow. But it was an afternoon ordeal involving cleats. When I couldn't locate my grit, I just passed and ordered a fresh bag. Hey, isn't this a good way to support the local economy! 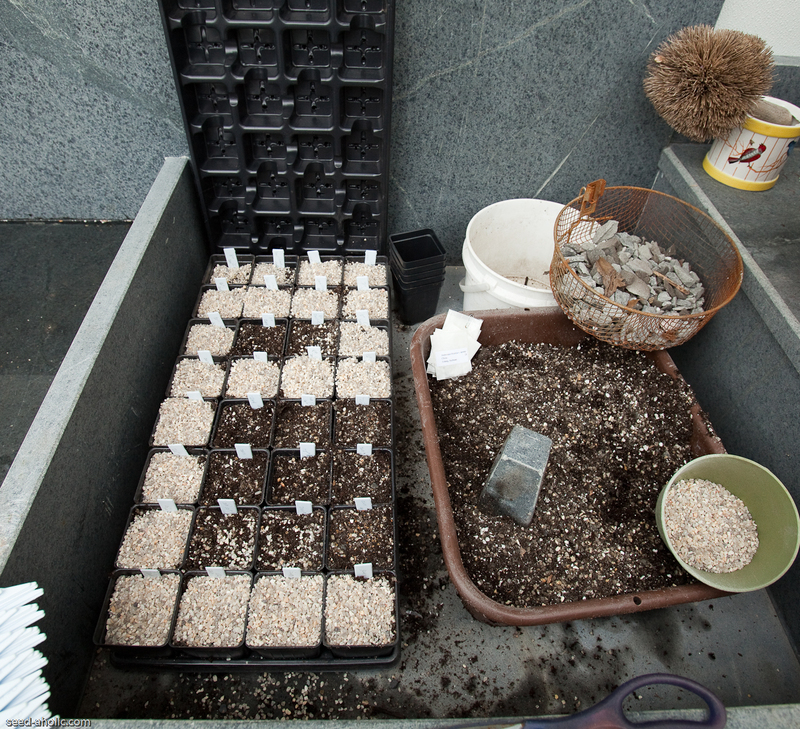 Upon delivery of the grit, it was time to get down to business - to sow those seeds. At the rate spring was arriving there was still plenty of time for them to freeze and thaw. But it was March, and spring impends. 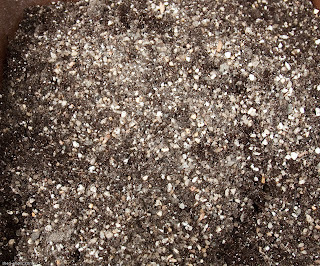 Continuing my love affair with crushed granite, I thought to try some in my potting mixes. 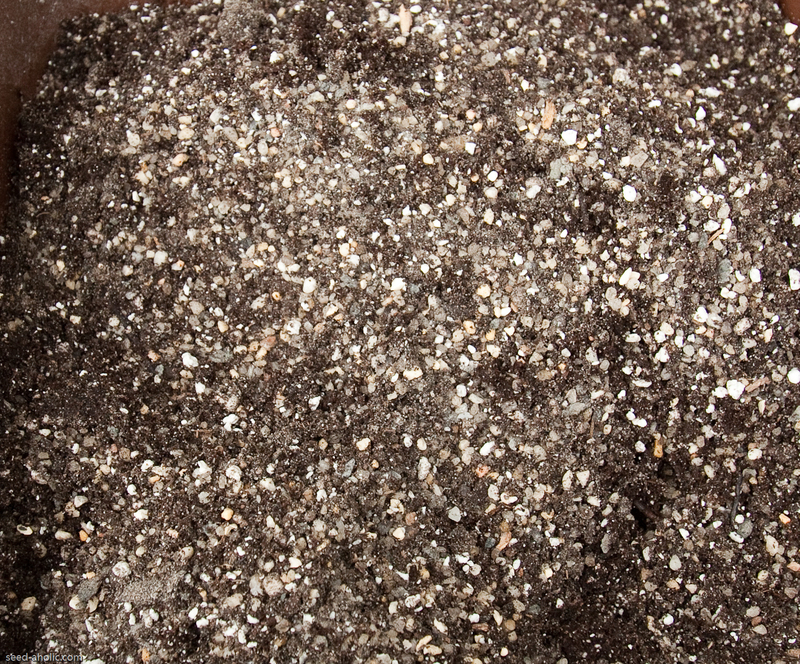 Maybe it would provide nutrients as well as temper the soil. 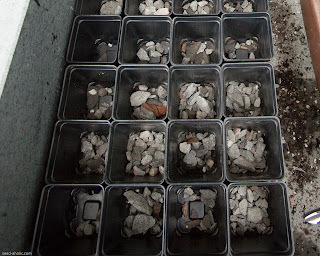 I start with clean trays and pots. My mentors always used smaller pots for seed germination, then graduated to other sizes for growing on or giving away. 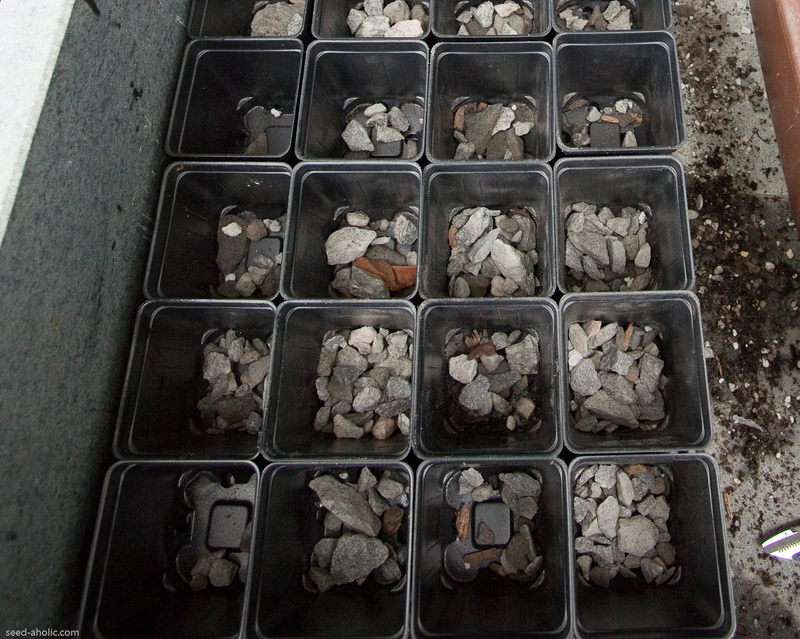 That meant not only different trays, but lots more pots sitting in storage. But these taller ones are all purpose. So I line out one tray's worth at a time full of the pots. Next I fill the bottom inch or so with stone. This year I am experimenting with coarser pieces of the "process" (crushed granite) instead of my usual lightweight slag. For a soil mix experiment I amend Jiffy mix with perlite, grit (#3 sandblasting sand), and process. After filling the pots, it is essential to compact them while the soilmix is still dry. I have a specially formed piece of soapstone which does the job. However, one could use the bottom of another pot if need be. 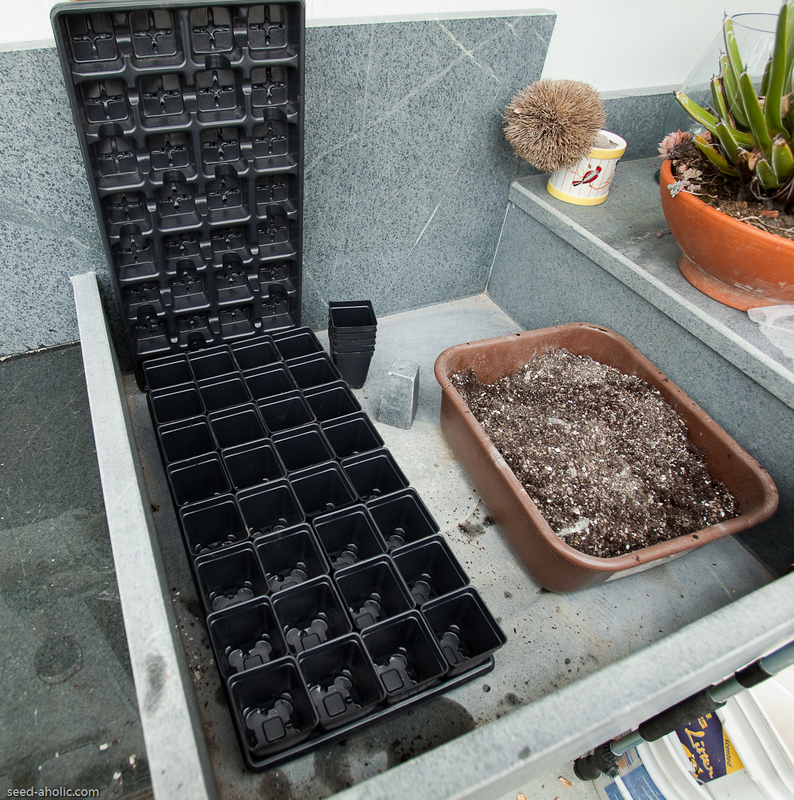 This ensures the soil level will remain the same after pots have been through several waterings. On to sowing the seed. After a light tap of the packet, out it comes. 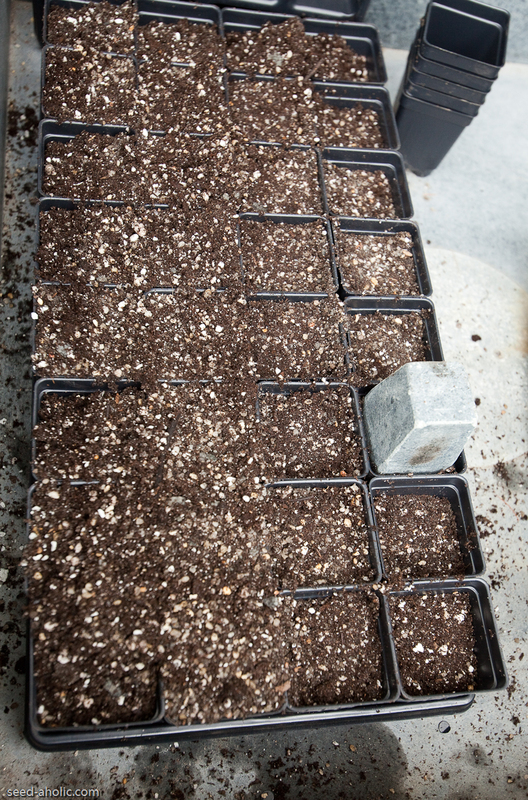 I like to spread it evenly, holding some back for another sowing if the packet is quite full. 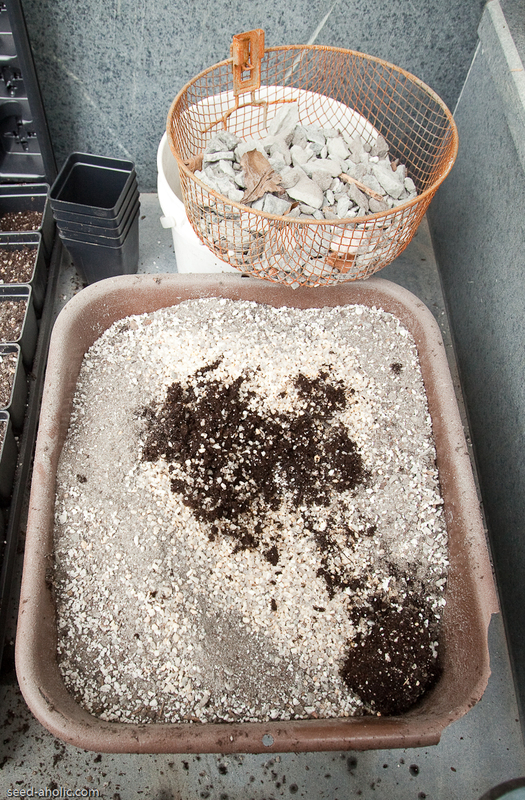 A healthy topdressing of the same grit #3 is useful for those seeds which prefer to germinate in the dark. Even those which do better in light, like primulas, get a little bit of grit#1. This seems to give a little buffer from the soil to the fresh crowns. Penstemons have never seemed to mind being left out of this scheme, so I don't bother them with it. Then it is just a matter of a good soak overnight. Or maybe even a day or two of imbibing while waiting for a storm to abate will be appreciated. 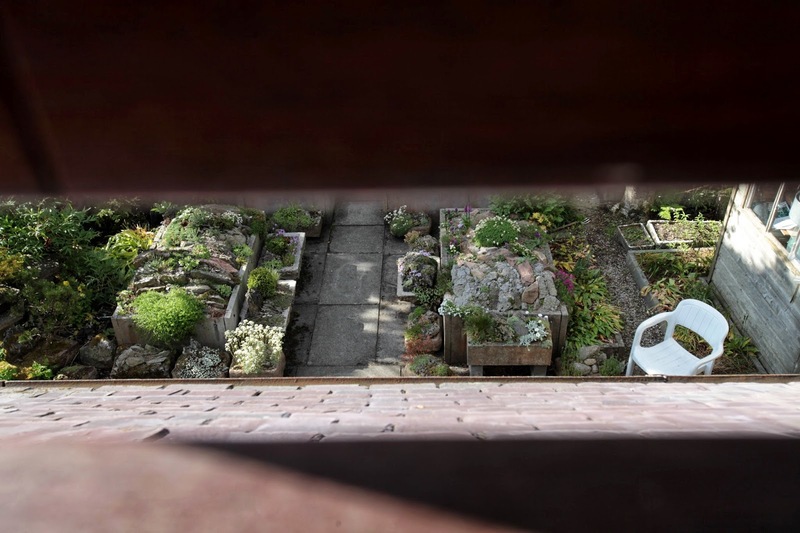 Then it's outside with the trays. And a little snow on top would be nice perhaps tonight! And it is not too late for six more weeks of freezing nights and warm days.